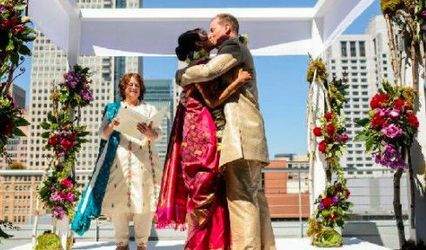 Given the Bay Area's diversity, I've had the honor of officiating a wide variety of highly personalized ceremonies for couples who vary greatly in their perspectives--from agnostic couples to those who are devout followers of their faith, to interfaith couples, to LGBTQ, my only requirement is that you love one another. 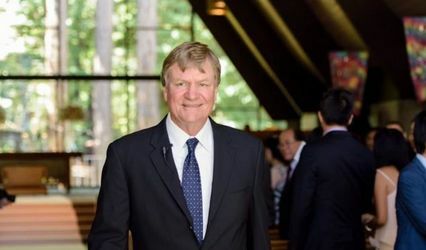 I invite you to visit my website to learn more about me and my services. 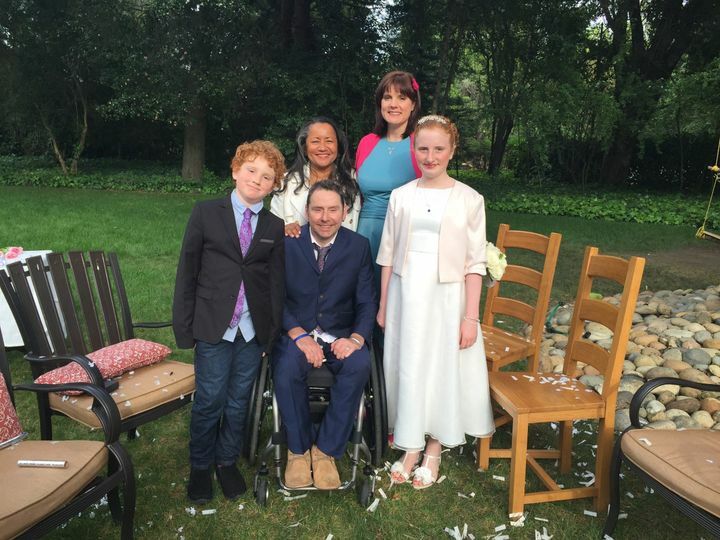 Above all, congratulations on your decision to be married and share life's journey together! 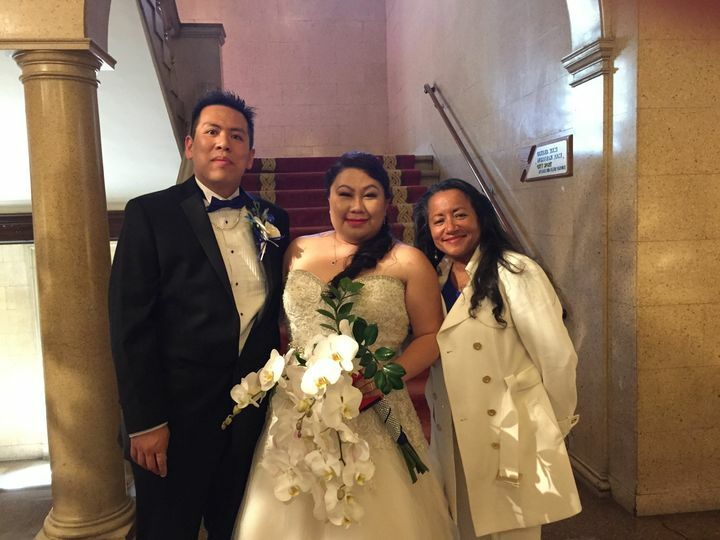 SF/Bay Area Wedding Officiant, marrying all couples in love! Preferred vendor: Boundary Oak Golf Club, Walnut Creek; Concannon Winery, Livermore; Kohl Mansion, Burlingame; Point San Pablo Harbor, Richmond. Congrats to Newlyweds Rosalien & Shiek. Venue: Palmdale Estate, Fremont. wishing this Newlywed couple life&apos;s best! 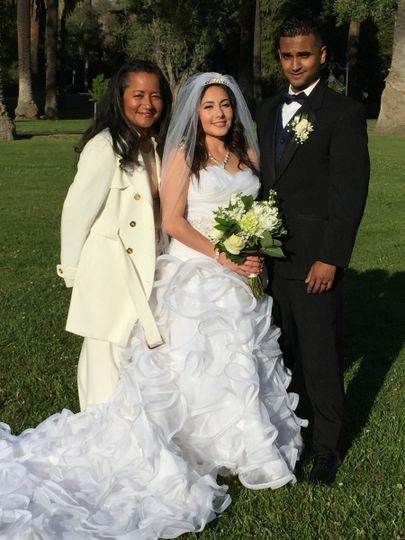 Congrats to newlyweds Kai & Vanessa. Venue: Wedgewood, San Leandro/Oakland. the guests took a tour of the property while the bride & groom took their "after-ceremony" photos. Saundra was the perfect officiant for us. 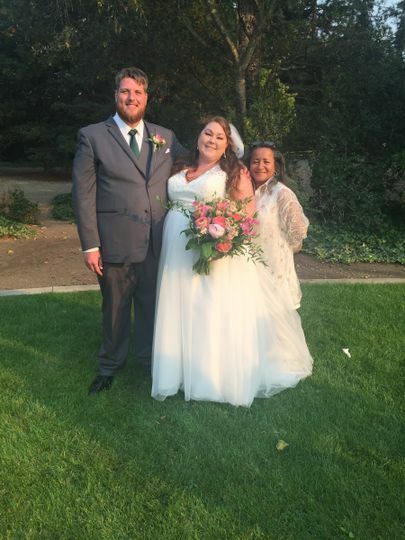 We learned of her when we attended the wedding of two friends a few years ago that she officiated, and when we started looking for a professional officiant, she was the first person we thought of. The level of detail that she learned about us leading up to the wedding, through emails and her questionnaires, led to a ceremony that encapsulated us and our relationship perfectly. We couldn't have asked for any better! 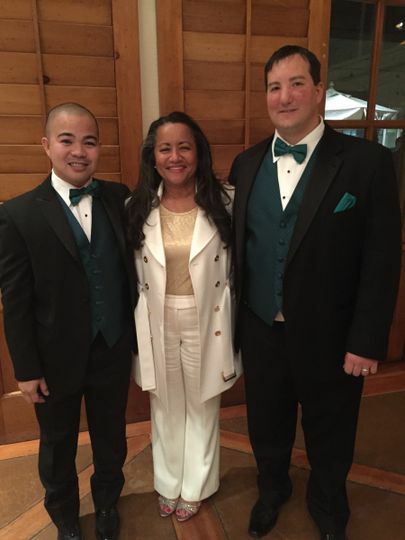 I cannot say enough good things about Saundra (IDoxTwo) and the wedding ceremony she officiated for us! Saundra is very professional and personable at the same time. She listened to what we wanted and didn’t want in our ceremony script, and made sure it was absolutely perfect. We both appreciated that our ceremony was personalized just for us and wasn’t just a generic speech that didn’t fit our personalities. Saundra added in some personal memories of ours in the ceremony, which was a nice surprise to us both! She also was very quick to answer any questions or concerns we had. 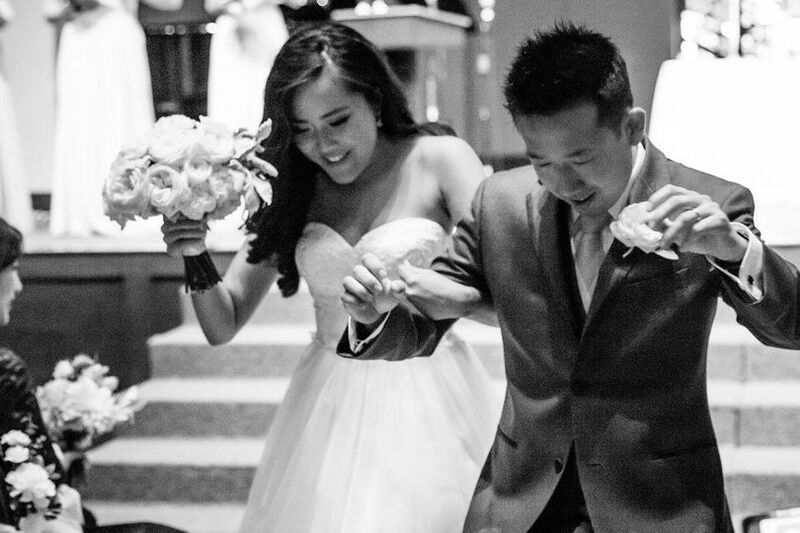 Our ceremony was absolutely perfect and went by so smoothly, all because of Saundra! 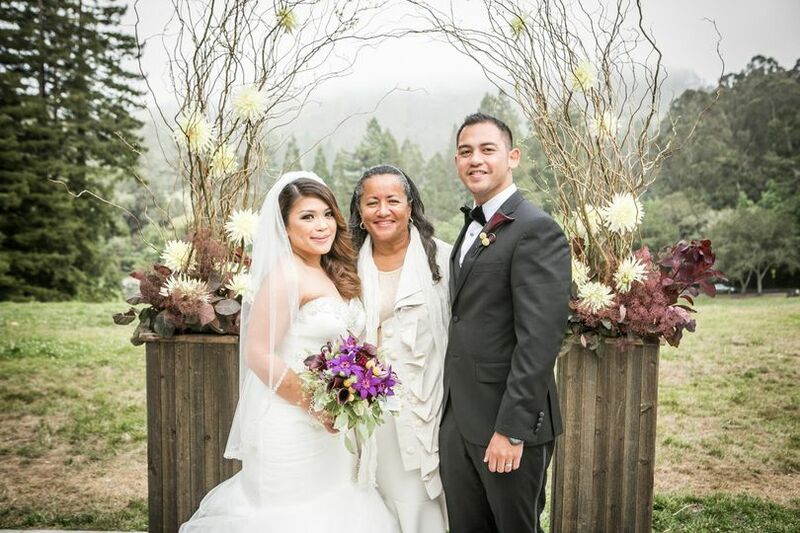 We would definitely recommend Saundra to anyone in the Bay Area looking for a wedding officiant. Couldn’t have asked for anyone better or anything more! Thank you again Saundra! 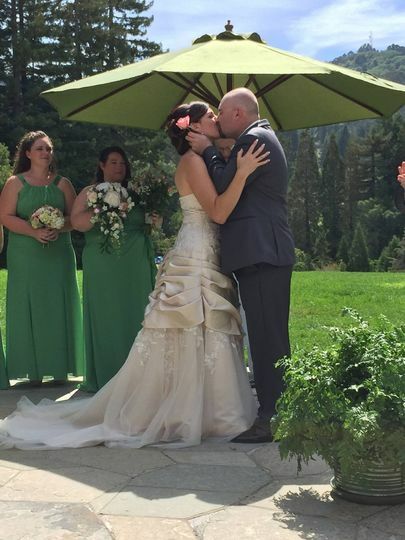 :-) (Once we receive our professional photos back, I will have to add one to our review). 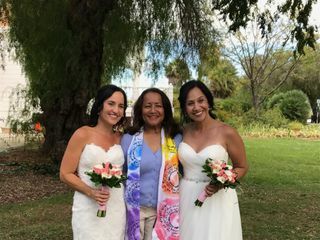 When looking for an officiant for our wedding, we came upon Saundra's listing on WeddingWire and she stood out for us from everyone else. We were looking for someone genuine and open, who would be able to put together and perform a ceremony that would be truly reflective of us as a couple. In addition, as wedding planning can (at times) be stressful, we were also looking for someone who would be easy to work with while also being just really good at what they did. 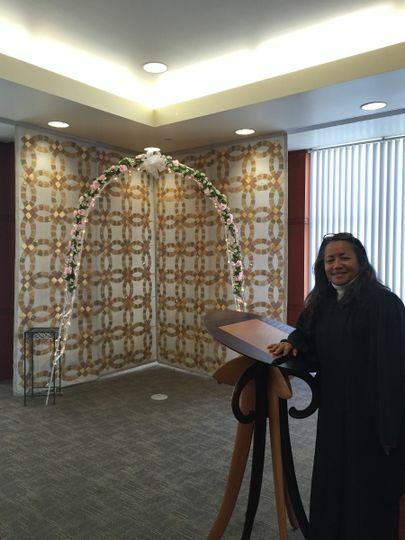 Let us tell you, if you are looking for an amazing officiant, who will add to your planning, your ceremony and ultimately your memories, Saundra is it. She helped guide us through the overall process. She asked the right questions to learn about us both as individuals and as a couple. She put together a beautiful proposed ceremony and asked us for feedback. 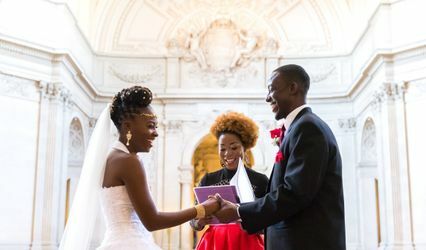 She helped guide us with creation of our own personally crafted wedding vows. And she met personally with us in advance, just to get a sense for us as people and to go over everything. In person, she is as genuine and wonderful as we thought she would be. On the day of the wedding, everything ran incredibly well. Saundra delivered a beautiful ceremony. She is a good orator and we felt warm and comfortable with her at the alter. As she has a teacher's background, she also made sure to guide our guests and ensure everyone knew what to do and where to be. We cannot recommend her any higher, so if you are looking for an officiant or related services, please reach out to her. You will be delighted.